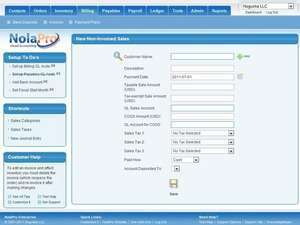 NolaPro Free Accounting is a fully-featured accounting suite which connects to online-based services such as web servers and clouds. Unlike many of the expensive accounting programs in the same category, it excels in the area of online cloud-based computing. In order to develop this software and offer it for free, NolaPro offers online services compatible with its accounting software starting at around $10 per month. Though useful for businesses needing online storage space, the paid service is by no means required to get this software up and running. Version 5.0.17089 is a freeware program which does not have restrictions and it's free so it doesn't cost anything. For security reasons, you should also check out the NolaPro Free Accounting download at LO4D.com which includes virus and malware tests. Additional screenshots of this application download may be available, too. NolaPro Free Accounting has a presence on social networks.